This property was in a rather sorry state prior to us removing the pebble dash and fully Renovating it’s exterior. In the 1960s it had had a cement based false Georgian facade created. Everything was cement including the cills. We had to stitch together a reasonable amount of cracks with heli bar. We decided to repair the window reveals as the brick underneath was weak and removing the mortar would have destroyed the reveals. Around the back we had to rebuild the reveals and replace lintels. We replaced all the window cills with natural slate. 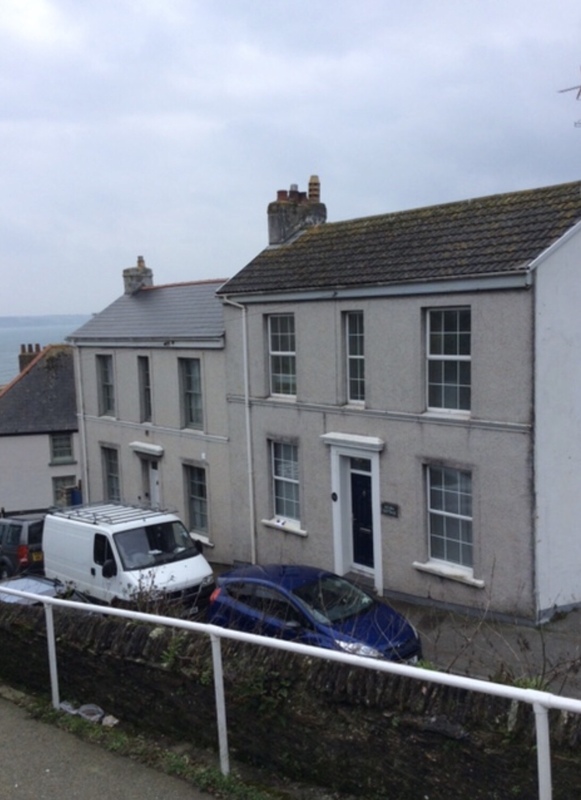 We replaced the windows on the higher property and fitted new rainwater goods. These were plastic cast iron effect gutters and down pipes and plastic black wood effect facia. We also removed an unused damp chimney between the two property’s. The remaining chimneys we have two coats of a mesh reinforced polymer coating. This is a very effective way of waterproofing them. They have gone from the ugly ducklings to the pair of beautiful swans of Swanpool Street. 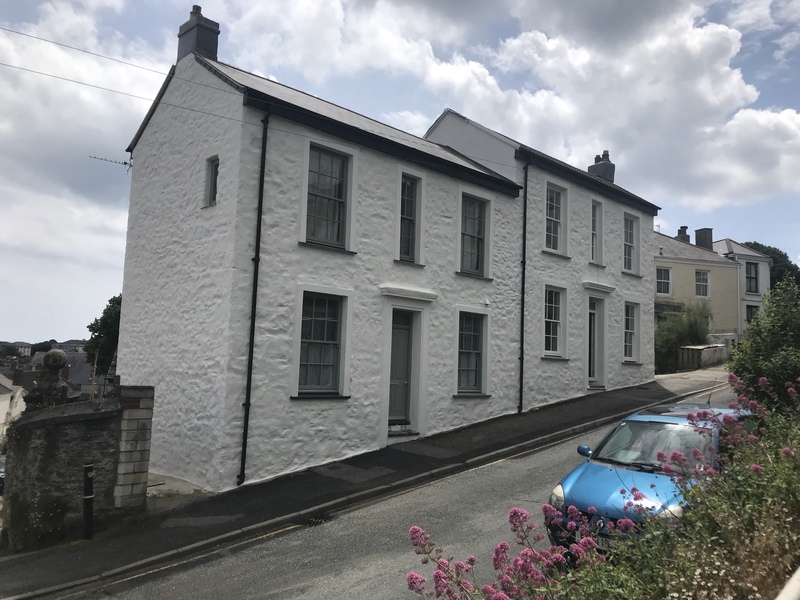 Here is a shot of the houses prior to the removal of the pebble dash They were rather ugly and the dashing had been done to hide the cracking on the 1960 failing render underneath. It was a shame to loose the central decorative rail. But it had been formed out of the railing render and fell off. 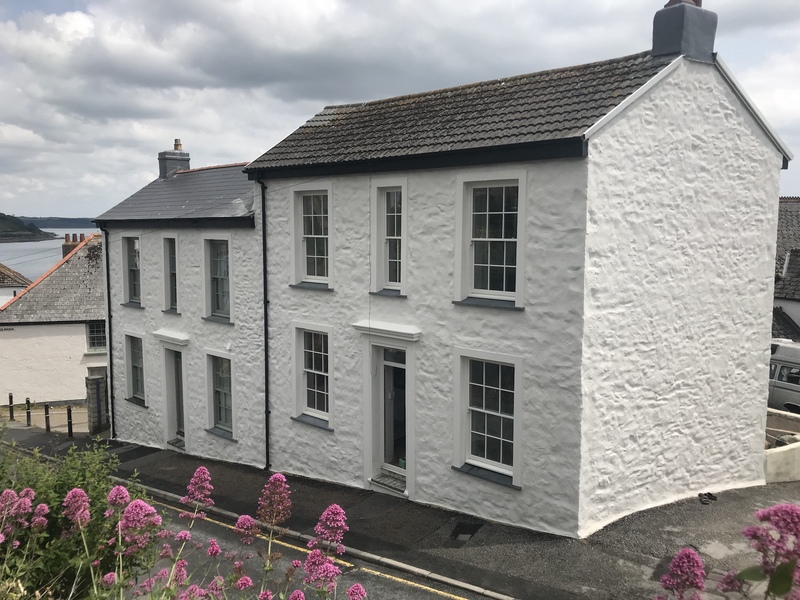 The window reveals required a fair amount of stripping then repair but with the addition of quality think slate cills have enhanced and maintained the character of the property. The entire building has been finished in beecks beeckacils tinted hydrophobic mineral coating. In old white colour 101.